Want to know one of the best ways to promote yourself? Here it is: Take the focus off yourself and put it where it counts the most: on your fans. There are many ways to do that, but one cool way is to record your musical journeys and interactions with fans ... and then share them. When I say record, I'm not talking audio (although that would be good too). You should also use video and good, old-fashioned still photos using a digital camera. Posing with workshop co-presenter Christine Kane (far right) and Asheville friends Shawn Gallaway and Lyna Farkas, after the "Empowered Artist" class in Asheville, NC. Instructor Kim Wangler (far left) and three of her Appalachian State University music promotion class students drove more than two hours to attend the Asheville, NC, workshop. 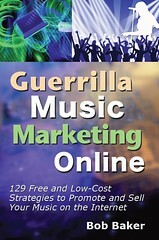 The class is using Guerrilla Music Marketing Handbook as a textbook. 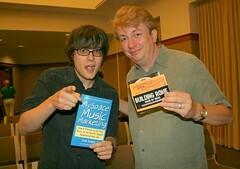 Posing with Judith Baker (no relation) after the "7 Secrets to Low-Cost Music Promotion" workshop in Nashville. Hawking respective wares with Jon Heisserer of the band Building Rome in St. Louis. See how this works? Can you find a way to use this idea to highlight and thank your fans? P.S. All the photos above were taken by Pooki. 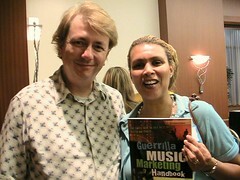 Check out Guerrilla Music Marketing Handbook, the classic guide to indie music promotion. Now revised and updated, with four new chapters on Internet and Web 2.0 music marketing. Get more details here.